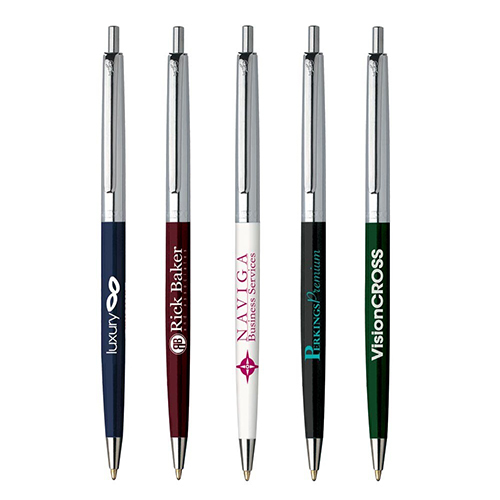 We have printed promo pens made from metal, plastic, and wood. They span different price ranges and come in different designs. You should choose a pen material based on the type of impact you want to have on your clients. Metal pens look luxurious and expensive while wood pens are eco-friendly and beautiful. We use specialised printing techniques to ensure your logo or company name looks clear and stands out on the pens. You have a limited amount of space on the pen so you need to use it wisely. Some brands use both the logos as well as the company name on the pens. This isn’t problem if your brand name is short or can be abbreviated reasonably. But if your brand name is too long, you shouldn’t print both the name and the logo on the pen. It’s a good idea to ensure the print is clear and easily visible without being too distracting. Look at the pen design carefully and decide what kind of print would look best on the surface. Colours or Black and White? This is also a common concern among our customers. Many modern brands use colours in their brand and logo. If the colour is an intrinsic part of your brand identity, you should use coloured print on your pens. However, if the shape and design of your logo and the font of your brand name is more important and recognisable, you should opt for black and white print. The monochromatic colour will pop and stand out well against the pen surface. As these printed promo pens will have your brand name or logo printed on them, you need to make sure they’re of good quality. It’s better to spend a little more on the promotional products than to give your customers and business associates something of poor quality. We source our pens from reliable manufacturers so you don’t have to worry about their quality. All of our pens have proven their effectiveness in real life situations. We recommend that you purchase metal, wood, or premium pens if you want to have the right impact on your clients.